Sikkim’s capital is a mix of old-world charm, serene Buddhist architecture and breathtaking mountain views. 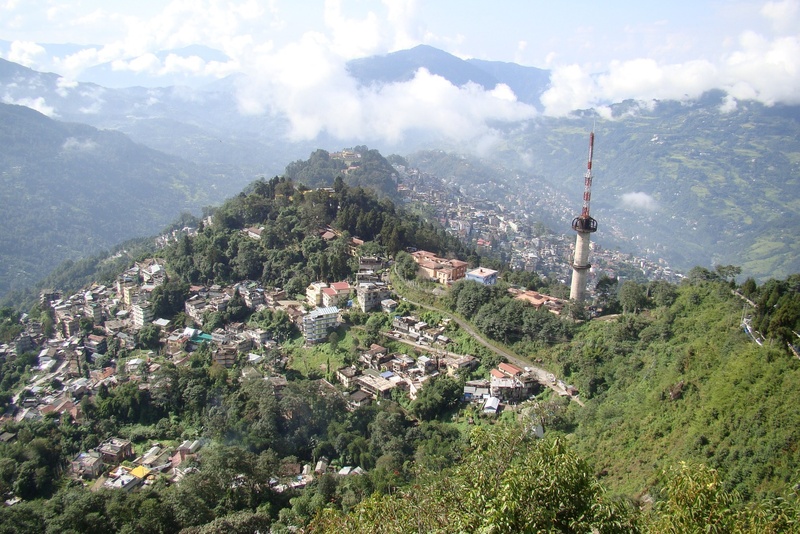 Find Siliguri to Gangtok cabs that will take you to this enchanting destination. While in Gangtok, make sure that you enjoy some quintessential local experiences. MG Marg maybe the more polished area of town and is a nice pretty spot for some photo ops. However, if you want more local flavors a walk down to Lal Market will give you just that, literally. Head over to some of the older restaurants and note the wooden partitions between tables. Enjoy some sliced pork or Tibetan staples like shyabales (meat pies) and of course, momos. If you are looking for mainland desi items you will find them up on MG Marg, the more touristy area of Gangtok. Throw back a couple of whiskeys at the Potala Restaurant or try the local Dansberg beer. Danny Denzongpa is quite a big deal in Gangtok – no guesses who the beer is named after. If you really want to feel like a local, try changing, the native brew of hot water and fermented millets. This sweetish brew is perfect for those cold evenings. Gangtok is a small town with the localities hugging the steep low mountains. It is also a very safe town and you will enjoy walking around and observing the neat little localities and houses. Views of Kanchenjunga Peak will greet you all the time – do not worry about the viewpoints that keep being mentioned in tourist guides. The whole town is one. Head over to Paljor stadium if there is a football match going. This is one of the most scenic stadiums in India, cut into a hillside and surrounded by beautiful valleys. A place that defines tranquillity itself, Rumtek is a short scenic drive away from Gangtok. This monastery complex was built in the 1700s and is the most spiritual centre of Buddhism in Sikkim. It is also the state’s largest monastery. One of the highlights here is the Golden Stupa where the relics of the 16th Karmapa have been enshrined. So this next one will take you a fair distance outside Gangtok but you cannot miss Nathu-La when it is just a few hours’ drive away. Go there just to experience what it feels like at over 4000 metres above sea level. Nathu-La is a mountain pass which falls on the India-China border. This mountain pass is part of a Silk Route off-shoot that connected Lhasa to the plains of East India. You can visit the war memorial at the Nathu-La post and even wave at the Chinese officers on the other side. Despite the recent notoriety of Sino-Indian relations, Nathu-La is a buzzing trading post and troops on both sides acknowledge the popularity of the place. On the way back, stop by at Changgu Lake. The serenity of this freezing cold water body and the rocky landscape is juxtaposed with a rather busy shopping complex. Expect to come across a lot of Chinese made goods at bargain prices here – the Tibetan trade trails have been going on for centuries even though the products change every generation. Hire a Siliguri taxi and enjoy the climb into the Himalayan foothills. The 120-km route is a slow and scenic winding one where you will be accompanied by deep valleys and the roaring Teesta below.